This intro is bound to grab the audience’s attention. It has been used in just about every style of music, from vaudeville to ragtime to Broadway. Hear it once and you’ll never forget it. Play it and you’ll be hooked. Just keep repeating the measures between the repeat signs, or vamp, until you’re ready to start the melody. well, a fast rockin’ song. This intro also contains grace notes. When a slow ballad is next on the set list, this intro works well. The left-hand part sets up a root-fifth-octave pattern. 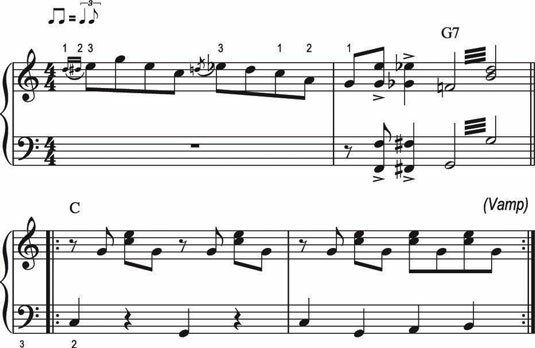 The right-hand part makes use of parallel sixths, moving sweetly down the scale. Sometimes you need to repeat an intro over and over. Perhaps you’ve forgotten the melody. Perhaps you’re waiting for divine inspiration. Or maybe you’re waiting for the singer to decide to join you. Whatever the case, you can easily repeat an intro like this one until the time comes to move on. 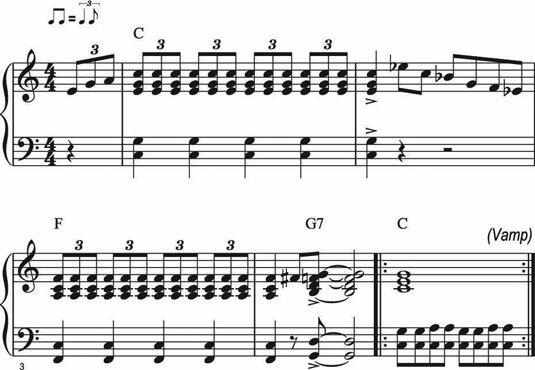 Simply play the first four measures over and over until you’re finally ready. 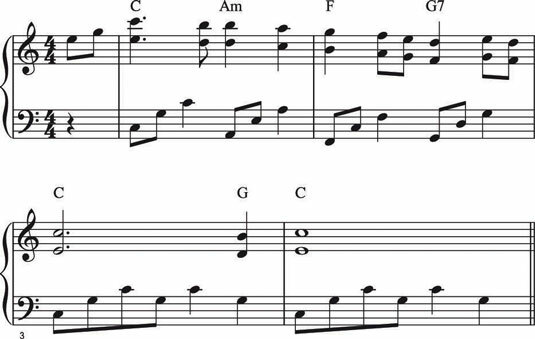 You’re simply vamping on a G7 chord, which leads you (and the preoccupied singer) into the key of C when you’re both ready. When you’re just tinkering around in a piano lounge, perhaps all you need is a few bars of honky-tonk style piano. Notice how effective the grace notes (measure 1) and tremolos (measure 2) are in this intro.